Sirola, Joseph | The Lambs, Inc.
Joe earned a BA in Business from Columbia and became an executive with Kimberly-Clark Corporation. By his late twenties, however, he had bid the business world adieu and become a professional actor. An extensive career on and off Broadway and in film and television followed. 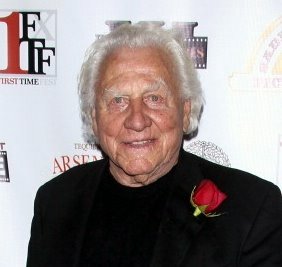 Joe Sirola has starred in more than 600 TV shows – everything from his own series’ such as The Montefuscos, and Wolf, to Get Smart, Man from U.N.C.L.E., and The Magician; and films – with Rock Hudson and Gina Lollobrigida in Strange Bedfellows; with Clint Eastwood in Hang ‘Em High and in such others as George Stevens’ The Greatest Story Ever Told, Super Cops, and Hail to the Chief; and on Broadway in Molly Brown; Pal Joey and Golden Rainbow among others. The Wall Street Journal named him “King of the Voiceovers,” having recorded 10,000+ commercials, and he has been called “The Green Thumb of the Upper East Side” for his amazing rooftop garden. His one-man piece, Shakespeare’s Ages of Man, where Joe performs eighteen of the bard’s great characters, is continually successful around the country. And, in the last few year’s Joe has returned to Broadway…this time as a Tony Award-winning producer. Among his Broadway producing credits are the Tony winning Best Play A Gentleman’s Guide To Love And Murder; The Trip To Bountiful; Rogers and Hammerstein’s Cinderella; Stick Fly and Time Stands Still. And that’s Joe Sirola– a man of many talents and the happy ability to pursue them all successfully.